Meet the new Apple...not quite the same as the old Apple. Since Tim Cook took the reins in Cupertino, almost four years ago, a gradual but inexorable change has taken place. And, speaking as a longtime follower of the company, there was to me no greater indication of that than this past week’s kerfuffle over artist royalty payments, and the eventual policy reversal from the company. Let us count the ways in which this whole to-do reflects the changing face of the company. First of all: Policy reversals are nothing new to Apple, even under Jobs. The company dropped the price of the original iPhone, for example, and launched a video iPod after Jobs derided the idea of watching video on one. 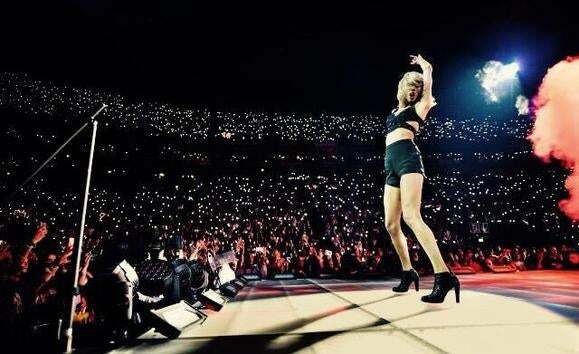 But in so many of those scenarios, those moves were conveyed less as reversal and more as “we meant to do this all along” or “I only said nobody would do that because nobody has done it right.” In this case, it was framed as a direct reaction to a complaint—Taylor Swift’s open letter—and carried at least a sentiment of the mea culpa, if not an out-and-out apology. Apple’s policy change regarding Apple Music seemed to be a direct response to Taylor Swift’s open letter. Secondly, this policy change was announced via Twitter. Apple’s been slow to embrace social networking. Though many of the company’s individual arms have a presence on the network—iTunes, the App Store, even the nascent Apple Music—there’s still no official Apple account. (Both @apple and @appleinc exist, but are essentially empty.) The same seems to go for Facebook, where there’s only an unofficial Apple page. Thirdly, that it came directly from senior vice president of Internet and Software Services Eddy Cue himself is significant. During Steve Jobs’s tenure, the vast majority of communication from Apple came either from the mouth of the CEO himself, or from Apple’s public relations team. Cook’s Apple, on the other hand, has put the rest of the executive team into far more visible positions, whether it be chief design officer Jony Ive’s veritable cornucopia of press profiles, senior vice president of Software Engineering Craig Federighi’s marathon presentation appearances, or senior vice president of worldwide marketing Phil Schiller’s recent appearance on Daring Fireball proprietor John Gruber’s podcast. Tim Cook may not be the next Steve Jobs, but his job isn’t “New Steve Jobs,” it’s “chief executive officer”: He’s there to keep the company running smoothly, so that the thousands of Apple employees can concentrate on making great products. He’s there to do what he’s good at and run the business, just like Jonathan Ive is there to do what he’s good at and design great hardware. That doesn’t mean that Cook doesn’t command attention himself, just that he knows when to step back from the limelight. Instead, he’s taken a page from Jobs’s playbook and spoke up about the matters that are important to him personally: things like equality, diversity, and health. The more I consider it, the more I’ve begun to think that even were Jobs still around, Cook might still be the better choice for CEO in this day and age. Can you imagine Jobs being as receptive as Cook was to calls for improved diversity at Apple? Or embracing social media? Or posing for selfies? Yeah, me neither. That Jobs was a genius at what he did is difficult to deny, and there’s no doubt that he could be charismatic when he felt like it, but in a time when concerns often revolve around issues like transparency and responsiveness, it’s hard not to think that his secretive and often waspish shtick might begin to wear thin. Meanwhile, Cook’s more relaxed grip and good-natured charm go a long way towards softening the company’s image—even as it continues to do business with ruthless efficiency. What I’m excited about is what comes next. Apple under Tim Cook will undeniably look a lot like Apple under Steve Jobs, at least for the foreseeable future. But at some point, it will change. Make no mistake: That process of change is far from over. The Apple of today is still clearly recognizable as the house that Jobs built, but it’s now become just as obvious that it’s a house that Cook has put a lot of energy into renovating.